RIP Amy Winehouse | F.A.T. If only she had worn a sweater, her health my have improved. 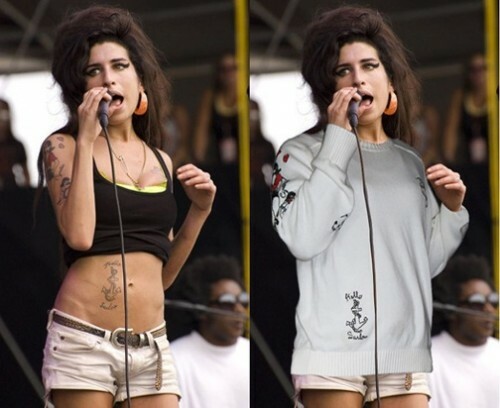 Sweater for Amy Winehouse by Andrew Salomone. I heard something about Amy Winehouse having health issues. Then I noticed that Amy Winehouse never seemed to be wearing a lot of clothes in any of the pictures I saw of her. I also noticed that she changed her look very often and looked drastically different from picture to picture. It occurred to me that maybe she felt like she had to wear revealing clothing in order to be recognized by showing off her distinctive tattoos. 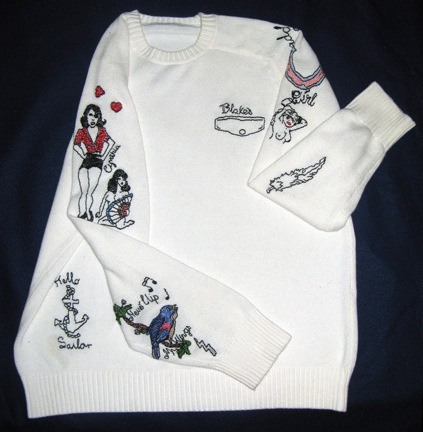 I found several pictures where it appears that even when she did wear warmer clothing, she was still forced to expose her tattoos.